Before she knew t'was Art." For today's post, I'm sharing about the L.M.A. books I'll be tackling this month for the challenge. I've decided upon 2 books -- one written by our beloved Miss Alcott, the second written as a fictionalized story about her family. Rose in Bloom is the sequel to Eight Cousins, which I adore so much. I've been looking forward to this one for a long while now -- seeing as how it's been all of FIVE years since I read Eight Cousins. Where has the time flown? I chose the second book for my list, Little Women Next Door, because our challenge co-host Susan Bailey recommended it as a good one a while back. 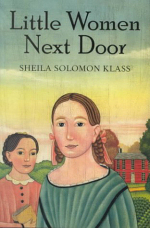 It's a fictional story told from the point of view of a young girl, neighbor to the Alcott family. A QUICK NOTE before closing... check back this Friday for a L.M. Alcott-themed GIVEAWAY that you won't want to miss! -- In fact, ALL Fridays in the month of June will have some exciting things going on (hint-hint!). 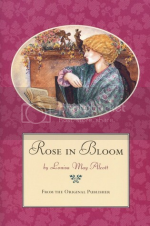 What book(s) are you reading for the Louisa May Alcott challenge this June? * Remember, it can be any book or story penned by the hand of Miss Alcott, or written about her. Ohh, you are going to LOVE LIttle Women Next Door, that's one of my favorite YA fiction stories based on the Alcotts. Meredith - I fixed the extra links, no problem. :) Thanks for joining the challenge! !